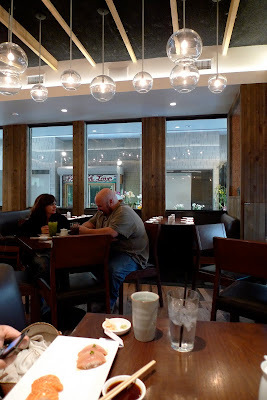 Pete's the one that actually told me about sugarFISH, the toned-down, simplified version of the infamous Sushi Nozawa. They only have tasting menus called "Trust Me," "Trust Me Lite," and the "Nozawa," whereby the chef determines the menu for the day, in omakase-fashion. Also once you walk in, you will see a very minimalist, modern set up, but no sushi counter or sushi chefs anywhere in sight, it's because they are hidden away in the kitchen. SugarFISH is located in a small strip mall in Brentwood. The silver fish icon was the only hint of a sushi restaurant nearby. We looked at the menu and thought the Trust Me Lite was a bit too lite for our appetites. We asked the waiter whether we should supplement with additional a la carte items, but he suggested we go with the Trust Me and said most people think it's enough for lunch. So that's what we did. We started with some edamame and some Tuna Sashimi with green onions and a light dressing. The tuna had a rosy red color and tasted really light and fresh. Next, we got the Albacore and Salmon Sushi. He said no soy sauce was necessary for the albacore. He was right, perfectly seasoned and melt-in-your mouth delicious. Coupled with the roasted sesame seeds, the Salmon Sushi was a sweet, buttery, nutty masterpiece that quickly dissipated in my mouth. Here's a pic of the Yellowtail and Halibut Sushi. Look at the color on the Yellowtail. It's like the perfect ombre of pink. haha. The sushi rice here is warm and loosely packed as you can see from the Halibut Sushi. There's something about warm rice and slices of buttery, cool fish that is just indescribable. The thing about sugarFISH is that the sushi is served as soon as it is made, so your dining companion might not get their plate at the same time as yours. I kept on getting mine first and I felt so bad but the waiter kept telling me, you have to eat it right away. This was the case for the two rolls that we got: the Crab and Toro Hand Rolls. I totally forgot to take pictures, sorry. I jokingly told Pete I would just make a mock hand roll, put in on a white plate and post up pics when I got home and try to fool you guys, but it's too much effort folks. I'll just leave the rest for your imagination. The waiter was right, you have to eat this fast because with the warm rice, the nori probably gets soggy pretty fast. Good thing I didn't have to wait too long, because the crisp sheet of nori encasing the rice snapped in my mouth giving way to the warm rice and smooth blue crab mixture inside. Delicious. The Toro Hand Roll was good too, but the decadence of the fish kind of got muddied in all of the rice and nori packaging. And for dessert, we got a special treat. Chris O'Donnell from NCIS: Los Angeles was enjoying lunch there as well. Aran, this pic is for you.